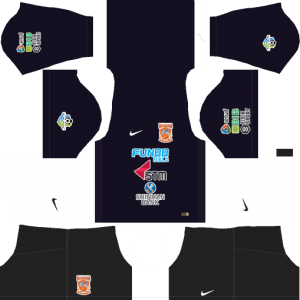 In this article, you can find and download Dream League Soccer (DLS) Borneo FC Kits and Logos 2018, 2019 Edition with URLs. Borneo FC is an Indonesian football club based in Samarinda, East Kalimantan, Indonesia. The club was founded recently on 7 March 2014. The club plays in the top division of Indonesian football which is the Liga 1. Borneo is in good shape this season and looking to secure a spot in top 4. Borneo FC plays its home matches at the Segiri Stadium in Samarinda. The stadium has a capacity of 16,000 people to withstand at an event hosted. The team is commonly known by the name of Pesut Etam in the local cities. Dejan Antonić is the current manager leading the club from the front. All the Indonesian football fans its time to relive the moment and play with your favorite football clubs kits. 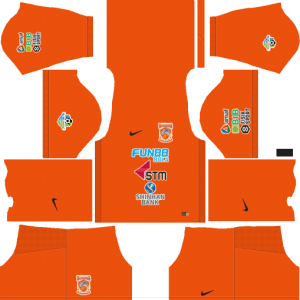 Now you can download Borneo FC Dream League Soccer Kits from our site and start playing with the kits and logo. All of the kits and logo are present in 512×512 size. The dls Borneo kit is a full orange kit which looks very attractive as it is a bright color. It also consists the logo of the club and the sponsors or the brands’ name on the kit. The away kit looks absolutely outstanding. It is a fully black kit and completely different color from the home kit. 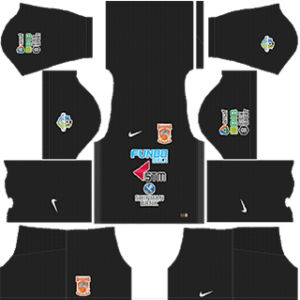 Borneo team uses this kit to play the away matches in all tournaments. 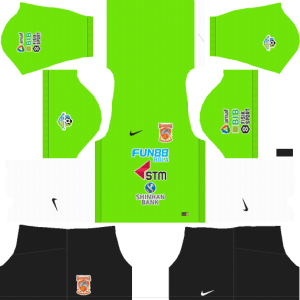 The gk home kit is a combination of green and back color with some patterns on the shorts. The goalkeeper wears the kit at the home matches to be played. The dls goalkeeper home kit is dark blue in color with various patterns present on the kit. It is hard to find out but the shorts are made of black color. The Borneo FC logo resembles like some kind of a diamond with a dolphin present in the middle of the logo. Football Club PUSAMANIA is present in bold at the top.